Can you sum up The Hill-Side in 5 words? What attracted you to work with TOMS? How did you hear about TOMS and why did the partnership come about? We're most excited about this partnership because we’ve always admired TOMS’ philanthropic mission, and it’s something we’ve wanted to get involved with ourselves. TOMS approached us about working on something together, and when we learned that they had never done a collaboration with a menswear brand before that really got us excited. Do you have any plans for the UK market? Do you plan to launch any other international territories? We currently sell The Hill-Side to about 5 retail stores in the UK, and approximately 20 more around the world. We would love to open a store for The Hill-Side one day in London, Paris, and/or Tokyo. What are your favorite New York / Brooklyn spots? New York style and London / European styles are very different; how do you think The Hill-Side collections will translate for our European/British customer? I think our collaborative collection with TOMS is pretty universally appealing. More than we do with our own clothing and accessories, we really worked hard to create footwear and eyewear with TOMS that is minimal and stripped down. For the footwear, we wanted to get to the essence of the classic TOMS silhouettes so that our fabrics would stand out. The result is a collection of somewhat subtle pieces, but with a level of quality, texture, and attention to detail that everyone should be able to appreciate. What are your top gift picks from the TOMS x The Hill-Side collection? 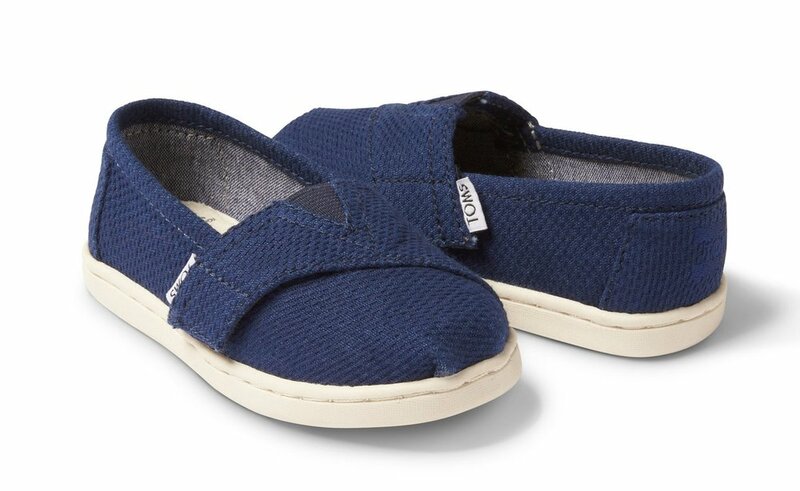 I think the TOMS x The Hill-Side Classic (Alpargata) in Indigo Sashiko would make a wonderful gift for everyone! They come in a full range of sizes for adults and kids, and even though we designed them with men in mind, they truly work as a unisex style. You are known for your entrepreneurial spirit – what inspired you to start The Hill-Side? We wanted to do something more meaningful and rewarding than the day jobs we were working at the time, and we loved the idea of working together on something as brothers. What sets The Hill-Side partnership with TOMS apart from other collaborations you have done in the past? The "giving" / philanthropic element of this partnership is new for us, and we couldn't be more enthusiastic about it. Where did the love for fabrics come from? And the fascination for the craft that goes into producing this fabrics? Our love of fabric came from collecting vintage clothing, especially military and workwear clothing. Early on we were always struck by a feeling of "they don't make this like they used to" when examining a beautiful old pair of jeans or a hunting coat or pair of army fatigues. Then when we got turned on to the Japanese brands that replicate old American garments, the thing that stood out most was the extreme attention to detail and craft that we saw in those Japanese fabrics. For us, that became something to always aspire to. What inspired the fabrications for this collection? The three fabrics on the footwear pieces are fabrics we've used in prior seasons or continue to use in our collection. We chose those for the fact that they represent The Hill-Side well and for how awesome they'd look on a pair of shoes. The printed fabric that we use on the sunglasses and the accessories is a reinterpretation of a floral print that we used a long time ago in one of our collections. We took the original print, scanned it into the computer, enlarged it dramatically, and filtered it with a gritty halftone dot pattern that's reminiscent of photocopied punk flyers. What is it about Japanese culture and design that inspires your brand identity? We first became fascinated with Japan when we discovered the Japanese brands that replicate and reimagine classic American vintage clothing. Learning that a whole group of Japanese clothing brands was making better jeans, out of better fabric, in a way that was more authentic to the original quality and construction methods of American jeans, opened up a world of investigation and discovery for us. You could make the case that we've learned more about our own American style history and culture through Japan than we have directly through American sources. This makes us continue to search for ways to look at American archetypes through new and different lenses. How would you wear / style your TOMS x The Hill-Side collection this season? The TOMS x The Hill-Side collection coordinates really well with our Fall 2016 clothing line. We styled them together for the lookbook we shot, and it worked really well. I would wear a pair of the Navy Herringbone Tweed Paseos and the Bellini sunglasses with our Stonewashed Okayama Jeans, our Indigo Peace Sign t-shirt, and our Wool Blanket Stripe Coupe Shirt. How does the collection work with the TOMS aesthetic? Our partnership collection strips down several existing TOMS designs to their bare silhouettes, and then applies beautiful materials. It works perfectly with the TOMS aesthetic because it honors the most intrinsic, basic parts of TOMS' designs. Has the TOMS giving message inspired you to incorporate giving into other areas of your business and how? We're doing a giving program ourselves for the accessories that are sold through the TOMS partnership, and we're planning to make that a part of what we do with special projects and collaborations in the future. How can brands work ethically in today’s world? How do you ensure that you are running an ethically minded business? For us, the way we try to define ethics in our brand is making every effort to be mindful of and connected to the people who make our products. Treating factories and manufacturers as business partners and friends, rather than simply "vendors," makes what we do feel like it can have a positive impact, however small, on people's lives.